Only 15 years later did she receive a handshake from her surgeon who said, “I’m discharging you” meaning she did not expect a recurrence. “We all carry scars in life, even the landscape; it’s how we begin again,” she says. Christina celebrated her 70th birthday this year. This year also marks six years of dedicated yoga practice. In 2008, she met Frank Jesse, who was then at the Clifton Hill Yoga Studio (prior to Frank and Jane Gibb starting Griffins Hill Yoga Retreat). Christina’s daughter Kathryn, an elite athlete representing Australia in rowing, had recommended yoga when her mother complained of back pain. “It was so bad I had to think about how to get out of bed each morning,” Christina says. Until then, she was a keen bushwalker – something she shared with her husband John. Her treating physiotherapist referred her to a back specialist, but the three-month wait made her willing to give anything a go – including yoga. “I felt very vulnerable,” says Christina of choosing private lessons with Frank over group lessons. What surprised her most is that she made a little bit of progress from the very first lesson. By the time she had her specialist visit, daily pain had reduced significantly. Although an MRI and X-ray report did reveal clinical issues including scoliosis, bulging disc and general wear and tear, she no longer needed a major medical intervention. Christina has continued weekly private lessons at the Clifton Hill Studio – even after Frank and Jane moved to Dunkeld in 2009. Christina has developed an almost-daily habit of yoga. After observing Christina’s results, her husband John now joins in. John’s involvement lead to an innovation: family holidays in retreat at Griffins Hill. Christina and John have been married for 12 years and have a blended family of five adult children and four grandchildren. John always joins Christina. John’s daughter Trish regularly accompanies them. “She is a great encourager of her less flexible dad and step-mother,” Christina says. John’s son Andrew has been twice. He travels from Canberra to join the retreat. “He values the flexibility yoga has contributed to his rock-climbing,” Christina says. She looks forward to her other children and grandchildren sharing the experience one day in the future too. Yoga has become an integral part of Christina looking after her body, and mind. “Yoga is invigorating and integrating, it involves the whole body. It’s terribly important in keeping flexible and strong – metaphorically too,” she says. Christina has set up a yoga space in her study. Frank and her husband co-designed a wall with ropes for both of them to use. 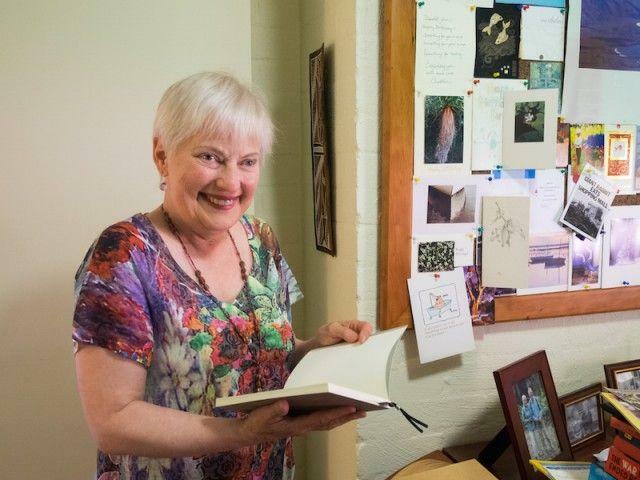 She wakes early, usually eats breakfast by 6:30am, writing in her journal – a habit she has maintained for nearly 50 years – and then moves to the yoga mat for her practice. Her goal is to do this most days. She keeps photographs and a notebook with a range of hand drawn poses that instruct how to use the ropes for a range of asana. Being helped by a good instructor is crucial to focus on the things that help, she says.